Horse Bowl is an educational project, in which 4&#8209;H'ers learn many aspects of the horse and how to work as a team member. Participants enhance their study skills by using selected reference materials. Topics include equine anatomy, conformation, feed and nutrition, evolution, breed characteristics, reproduction, horse management, way-of-going, tack and equipment, styles of riding and the exhibition of horses. This accumulated knowledge is tested in the form of a contest, similar to a "College Quiz Bowl" competition. 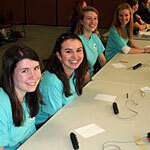 At the contest, 4‑H'ers must work together with three other team members to answer questions to the best of their ability. The knowledge and skills gained in the participation of this project are carried on to all other aspects and projects of the New Jersey 4‑H Horse Program, such as Horse Judging and Hippology, and possibly into the career or work field. The 4‑H Horse Bowl Project can be a fun, informative activity for 4‑H Horse, Horse Science, Model Horse or Veterinary Science clubs. "Mock" contests can be held during club meetings to practice for the actual contest. It is important to follow the contest rules as closely as possible in preparation for the actual event. Snow Date: February 25, 2018.